Get the jump on your New Year’s resolutions in this week’s photo challenge. As I write, a winter storm — with 70km winds and driving snow — rages outside. You’d never know that we had the warmest fall on record with temperatures well above average, and on the day this photo was taken, sunshine that revealed a bright horizon. 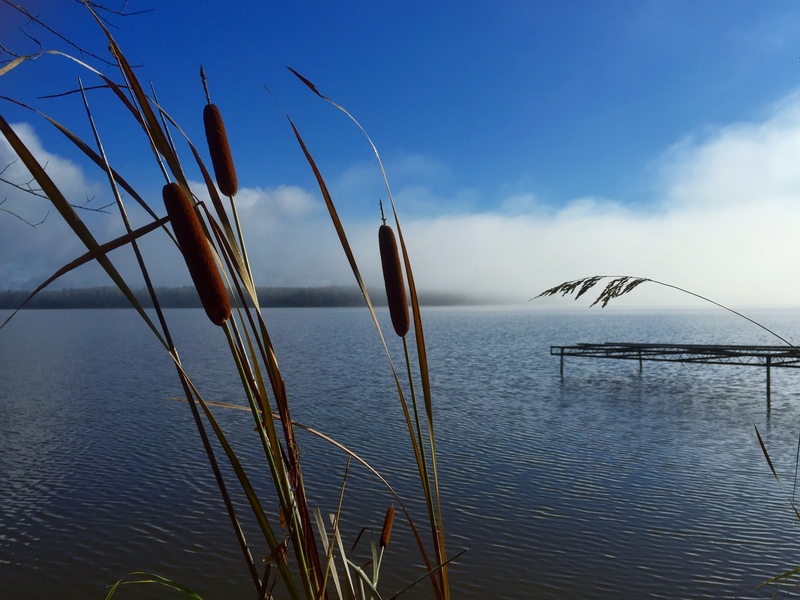 In this image, nature — in the form of bent prairie grass — is actually pointing directly at the far shore, where the fog is lifting from the water. It’s saying, “Look ahead! How will you make the best of this beautiful day?” I love how it allowed me not only to enjoy a lovely moment, but also to shift my perspective to the future. Lovely shot and a very open challenge! Cold here, too, with more snow in the offing. Awesome — please feel welcome to share a link to your response, but not to your site in general. If you’d like to ask readers to visit your site, please visit and comment at The Community Pool. What an open challenge….I have not thought about the New Year’s resolutions yet, but I hope that I can develop my photography skills and that I can shoot even more in new places and locally as well. My go this weekend is from Copenhagen. What a great shot, @petrus! I love how the lines envelop the human subjects. It will be the same horizon but a new existence – I hope! This is an excellent challenge! Can it be posted any time on Fridays? Thank you! Please don’t feel pinned down to posting on Fridays — the challenge runs all week until a new challenge is posted each Friday and you’re welcome to post on any day of the week that suits you. Thank you so much — I’ll pass your kind words on to the photographer (my husband). Wow — gorgeous shot of the fog. Lovely work! Thanks, Krista! I appreciate your visit! A beautiful photo, Mike, and a great theme, Krista! Thank you Marion — I’ll share your kind words! Oh what it would be like to get out on that boat right now in your photo. So peaceful. The bus’ colors really suit that sunset — nicely done. Hello, I love this, it is beautifully put awesome. Great topic! Looking forward to selecting an image to fit the challenge. It’s a good idea to change the perspective to the future. Thank you for the challenge! I accept. You’re beautiful photo of the water is like a sigh of relief. Your description of the storm has me dreaming of cold snowy days, a blazing fire and no place to go. I’m a Minnesota girl living in Southern California. Hmmmm. Wow, six daughters! I love the inquisitive look on your squirrel’s face. New Horizon – perfect idea for the week ahead and.. New Year as well! Cheers. Krista… Thanks for getting me to think past today. So busy it’s difficult to break the habit! Have a great weekend! Ah, thanks! The photo at twilight of the tree lit by the sunset is my favorite of yours, Joe. I love that half light as darkness starts to fall. It is, I am so fortunate. A very festive season to you, too! Great image Mike Stevens! Great read Krista! Beautiful theme Krista, I loved it. Thank you! Of your photos, my favorite is the one of the steps walking off toward the sunset. They do such a nice job of leading the eye. The Lazy Wanderer Ready for 2017? One Foot Out the Door Out with the Old, In with the New! The Lady’s New Horizon – "Live Free & Love On Purpose!!" Thirty Summers 2017 – Seeking New Horizons. Physically and photographically. Travels in the Middle East and beyond Weekly Photo Challenge: New Horizon…. The Everyday Adventurer Free your spirit – New horizon! Ouch!! My back hurts!! New Horizons? Giggles & Tales Weekly Photo Challenge – Horizon! New Horizon – While there is life, there is hope! Forest Garden Altered Perspective…. ? Third Time Lucky! What’s on the horizon? Views from Greece. sonja benskin mesher .a new horizon. Weekly Photo Challenge: New Horizon – L'S THOUGHTS…. Musin' With Susan Taking Flight!